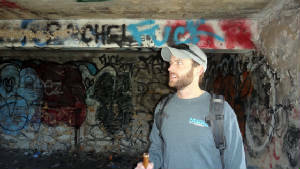 Great hiking among the ruins! 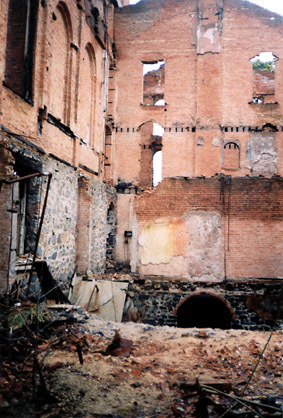 Just minutes from the quaint streets of historic Ellicott City lie the ruins of St. Mary's College. 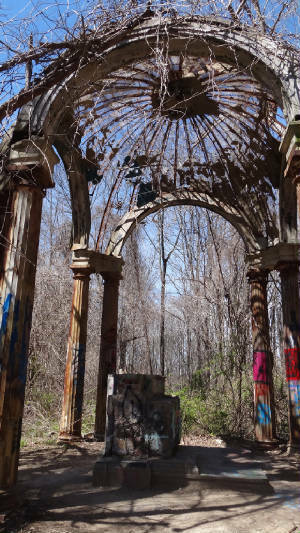 Perched atop a hill deep in the forests that border Patapsco Valley State Park and Ilchester Road, the abandoned seminary bustled for more than a century with young men entering the priesthood. But since it closed in 1972 due to dropping enrollment, legend has engulfed what remains of the campus. 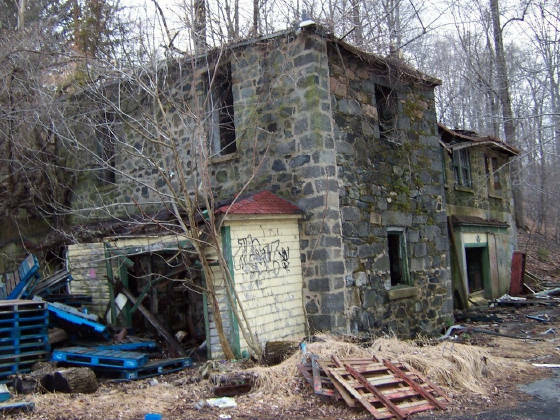 The ruins continue to terrify local thrill seekers, who have given it the name "Hell House." 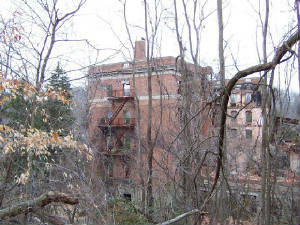 Although many of the buildings have been torn down, the creepiness of the property persists. As you travel up the hillside, among overgrown pathways and crumbling staircases that lead to nowhere, the sounds of the road below fade out. The trees thicken and the sky above becomes obscured. Many of the original buildings lie in piles of rubble except for one: the remains of an old cemetery. Commonly mistaken for a chapel, the headstones are gone and the outer wall is crumbling. But centered atop a series of stairs is a decaying shrine. 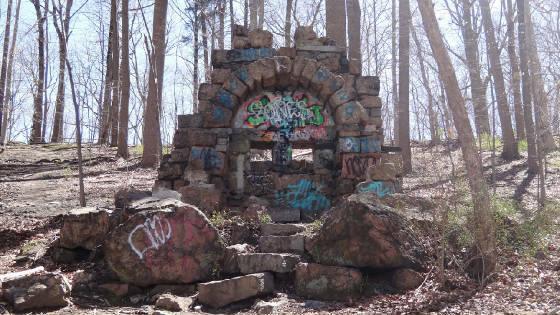 Its altar is tagged with graffiti, but a giant metal crucifix remains, jutting toward a columned covering. It is here where many of the legends have emerged, including the nickname "Hell House." One story claims a priest murdered several students and placed their bodies in the shape of a pentagram as a sacrifice to the devil before killing himself. Another maintains that a deranged caretaker roams the property toting a shotgun. Although such stories have long been disproved, the remains of Hell House are no less frightening, perhaps not for what is said to have occurred there, but for the deterioration and reclamation by Mother Nature herself. Hell House remained mostly intact for several decades until a mysterious fire destroyed a large portion of the property in November 1997. The result was even more haunting, as a crumbled and charred red brick building with shattered windows and ubiquitous graffiti now sat ominously on the hill. Over time, word spread of the haunted school and visitors began to come in droves. The property owner then attempted to deter these trespassers with guard dogs and local police. Today, only rubble remains. The last of the standing structures were knocked down in the mid 2000s. 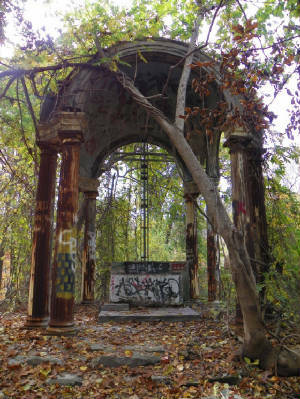 However, several sets of staircases leading up to the school are still intact, giving the wooded ruins an eerie, hair-raising atmosphere. St. Marys College was a Roman Catholic school in Ilchester, Maryland (Illchester Mills) near modern Ellicott City, Maryland in Howard County. 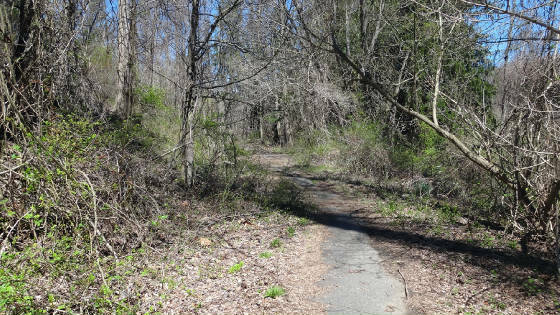 The ruins are near Ilchester and Bonnie Branch roads. 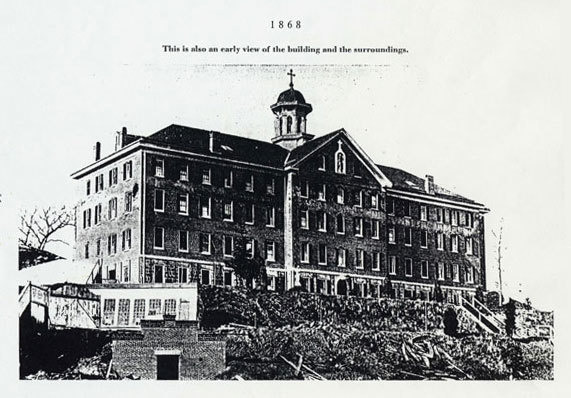 The upper college building was built in 1868 consisting of a cupola topped eighteen bay by five bay building with a five by five bay projection. A three by three bay, five story "L" shaped addition is included, with all of the structure on a stone foundation. A three story chapel was attached to the building in 1882. In 1934 a fifth floor was added throughout. A statue of Madonna with Child was situated in a niche. 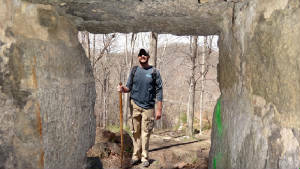 I had read the stories and hear the legends, but one fine April day in 2017, I and my cousin Matt decided to check it out for ourselves. I took a K-2 meter which picks up fluctuatuions in EMF, a temp pod that picks up rapid temp changes, and a EVP recorder. We climbed the old driveway slowly uphill to the place where the main buildling once stood. All that was left now was rubble. Next I took Matt to the Bunker where you can get inside and underground! 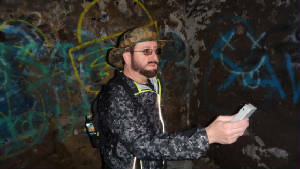 Once in the bunker, there were two rooms. A large window looked down into the valley from the first room. Stairs led down to a second level but were blocked by large concrete and iron gurders. Matt was first into the dark second room. Once inside, i ran my EVP recorder and used the K-2 meter to check the place out. The stone was amazing, covered in graffiti, yet still very cool. We wondered what this might be, and how many kids have partied here. We took pictures and in one i clearly got an orb. Now we knew we were not alone! Further investigation was cut short by several teenagers coming down into our space. Then Matt had a bad feeling and said the walls were closing in on him. I felt something on my shoulders that was not a good thing and we started to go out. Matt, scared the first girl who screamed when he came out of the room into the light! That was funny. Afte leaving the bunker, we headed down a path to what I call "the elf house". Situated on a cliff overlooking the valley, this stone structure is puzzling. It has two windows which face the valley, but is rather small. Matt thinks it is a look out house. Hard to say, but i got a disembodied voice here which seemed to follow us when we went to the Altar. Some stone and some brick were used to make or patch up this wall. Our teenage friends were on top of us again, so we moved on to the altar. At the gates of hell house altar, we got two more disembodied voices. One that mimicked Matt "Wait a minute", and another that says "pictures of colors", which is true. The stone columns are covered in colorful graffiti, as is about everything else including the altar. 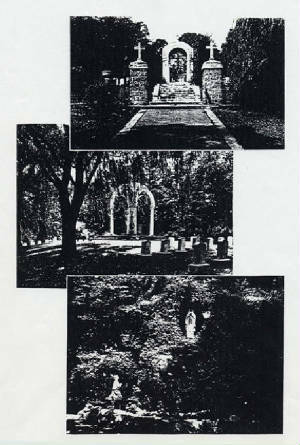 This was the cemetery and they say the head stones were removed but not the bodies! Who knows. At one time it would have been very serene and beautiful. Here at the altar, the temp pod went nuts, the K-2 was flashing in response to questions, and we would later listen to the audio and hear "Give Respect". Matt and I always give respect, so they liked us. We stayed awhile and got some great evidence. Then we headed up the trail. We came to a "Y" and went right. The road we were walking on, Matt noticed seemed to be hollow. 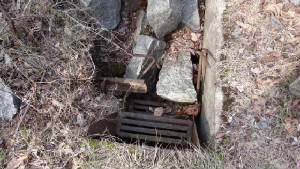 Then we found a hole in the ground which seemed to show that there was a structure under the road. It seems the tunnels they built were everywhere. I almost wanted to go in and look for an opening, but too risky. We continued on past the wreck of an old VW Microbus. The path curved up to a large water tank. Here we got more audio evidence. 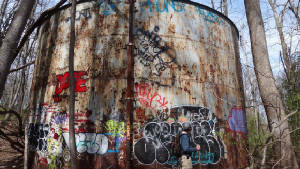 The water tank was covered in graffiti, ha, imagine that! Still it had some old rivets holding it together that looked like it might be from the Titanic! With the wind that day, it was hard to hear anything in the field, but the audio evp evidence we got was way more than i imagined. Someone was asking for help, and if we knew that, we would have helped them. This only makes us resolve to go back! Another foundation grabbed our attention as we headed toward the pool. After going in and deducting that this had to be a pool, we went over to check out a foundation. Later I would identify this area as the "Caretakers shack", from the 1990's when a man lived on the property to protect it. Rufus and his dogs got in trouble for assaulting kids and later the shack burned down. The signs of this were all over and we could tell this was an important area for maintainence. If there was any spirit with us who was nasty, this was him, the caretaker. We would run into him later in the lower bunker level, but right here, we felt no fear. After doubling back thru the pool, we headed back toward the altar. Past the entrance to the cemetery, we found a path that led down to the grotto area. We took some pictures and enjoyed the view. Using a lower path, we walked on until we were stopped for a moment taking pictures and a couple called out "hey did ya see any ghosts?". We stopped and talked for awhile. It was here Cathy told us some tales that seemed right out of hell itself. 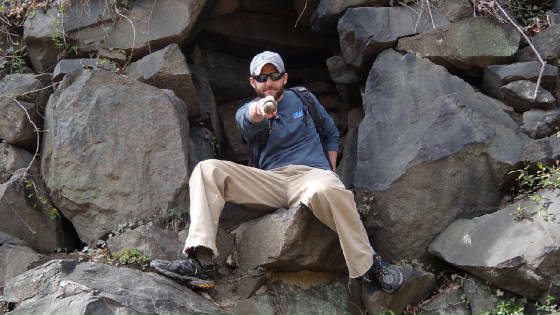 Matt poses in the "Grotto"
We got this orb in the bunker, right after getting K-2 hits. This place is active even in the daytime!